The thing about a critter obsession is that it can be rather relentless, kind of like trying to shake a pitbull off my leg. Having the good fortune to travel into Asia regularly allows me to feed the pitbull and quell the beast momentarily. I love to explore and investigate now as much as I did in my childhood, but I never could have imagined how amazing nature can be. With my cross-hairs fixed on my primary target and my hopes high, the adventure to Ambon begins. It seems that many of the animals in the Indo-Pacific are bio-geographically interchangeable, meaning that the ability to find the same critters exists throughout the critter triangle. However, it is my theory that certain animals are unique to each and every place. This theory again compels me to pack my bags and book that ticket. So while my sights are set on finding a particular animal, I also know that I will be able to fill my card with various other critter finds. After exchanging a few e-mails with Andy at Maluku Divers everything was set, and the last item was to forward my shortened critter list for this trip. 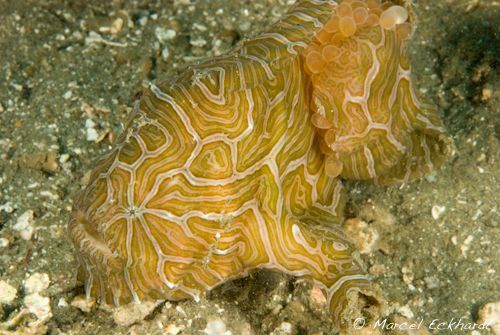 On this list were of course the obligatory Maluku Frogfish, Pipehorse, and others. Ambon sits at the gateway to the Raja Ampat Islands in West Papua and has become a stopover place to pick up liveaboards. ”It's nice to relax for a day or two to decompress before getting on the boat,” said a guest. 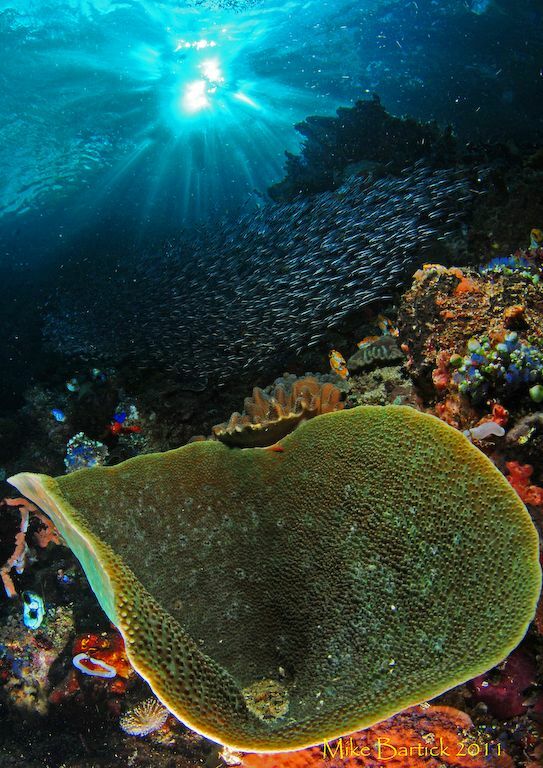 I suppose…but the seriously obsessed critterheads should just stay put and explore the wonders that Ambon has to offer. Dive model Gladys and a frogfish. Maluku Divers is set back in a calm bay surrounded by fishing villages and light industrial fishing boats. The bay itself is rather deep, and is fringed by sandy sloping dive sites. There is also the occasional wall dive, bommies, broken coral beds, grassy flats, and other interesting habitats. Some of my favorites to explore are the silty troughs that exist throughout the bay. These troughs dump themselves into deep water and provide many critters a safe passage as they commute from the deep to feed, and then return safely at different times of the day. 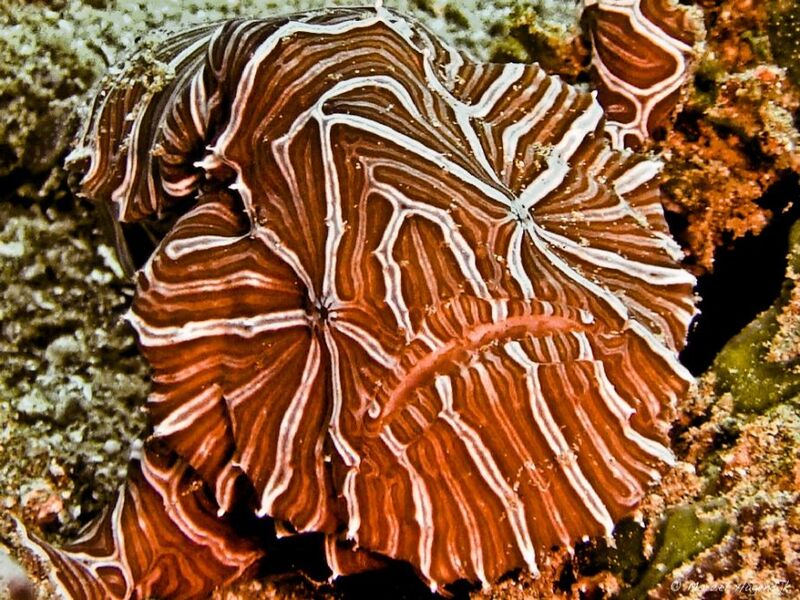 The leaf scorpionfish is a critter that I love but don’t get a chance to see that often. They actually remind me of miniature Rhinopias. 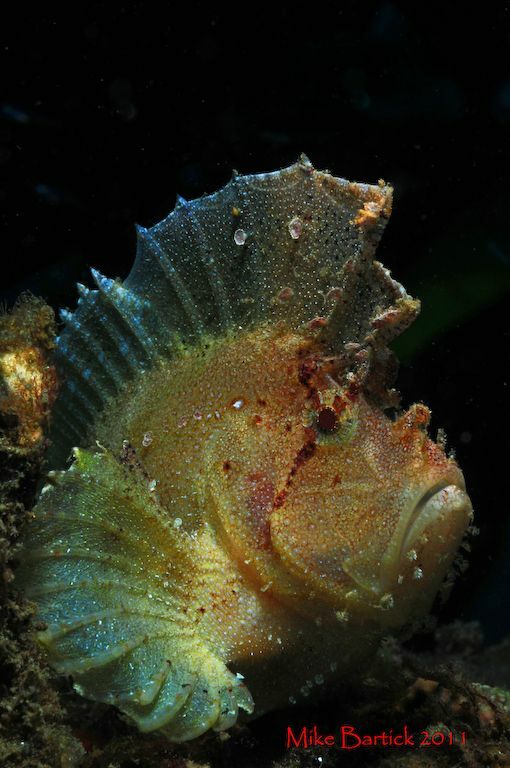 The Scorpionfish traits become apparent with just one look, tall dorsal fin, compacted face, appendages or light frondosa above the eye’s and a gape feeder to boot. These guys come in several colors ranging from brown to red, white, yellow, and more. Their lie and wait nature allows them to utilize their clever disguise, remaining motionless until their prey approaches. The same holds true for photographers as well allowing me the chance for some creative lighting. 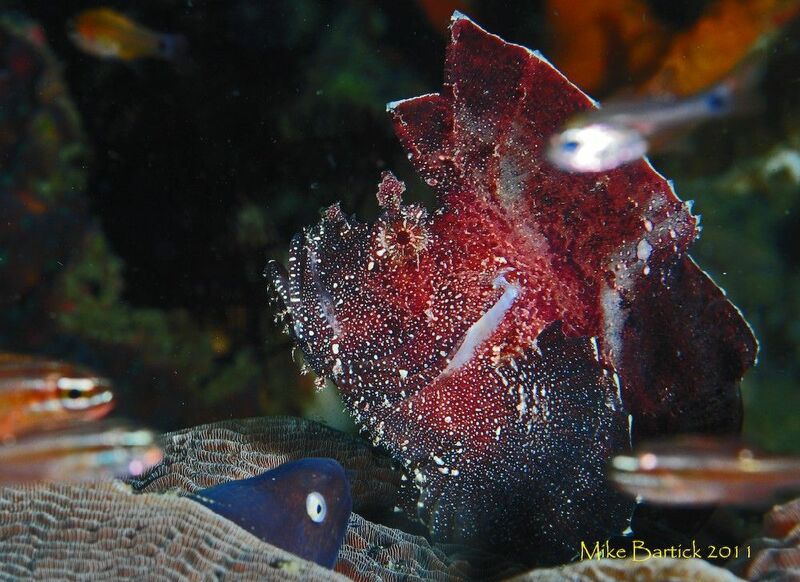 Ambon and Maluku divers were pushed into the spotlight a few years ago when a guest returned with a snapshot of the now world famous Maluku frogfish. 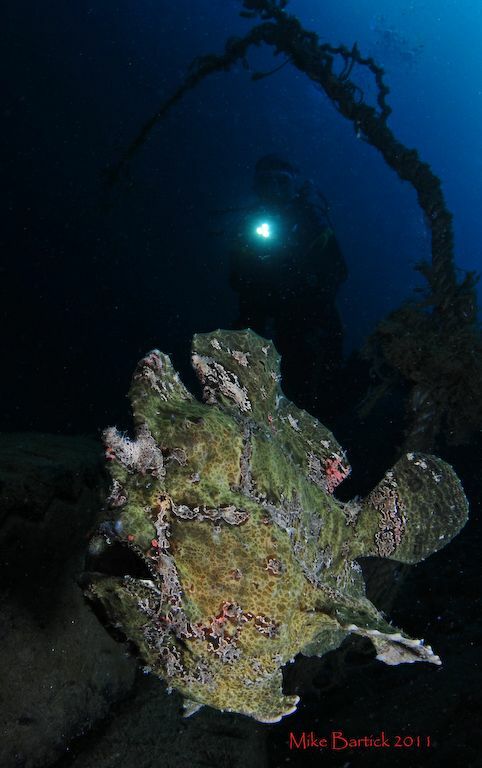 This frogfish helped to put Ambon on the map as a prime muck diving destination for me and many others. The result of such a find is equal to a muck diving gold rush that sent shockwaves through the Critterhead community. Since then guests have been coming in regularly to photograph it. Maluku frogfish. Photo by Marcel Eckhardt. It is an amazing creature that remains at the top of my list for many reasons. 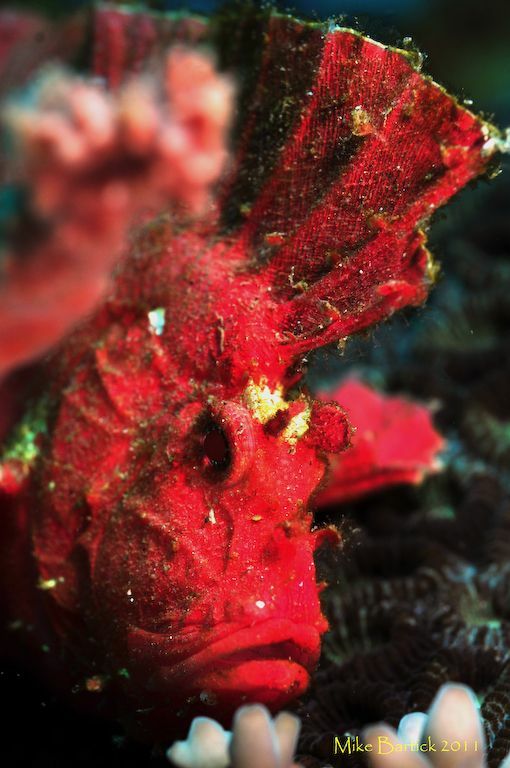 Is the Maluku frogfish one-of-a-kind? We hope not. But it does support my theory of the unique critters that we find at each of our destinations. Looking closely though at the images (provided by Marcel Eckhardt) on the right you will see that our special little friend is bearing eggs. Wow this is HUGE! No wonder it has become such a gold rush to see this unique creature. Maluku frogfish with eggs. Photo by Marcel Eckhardt. 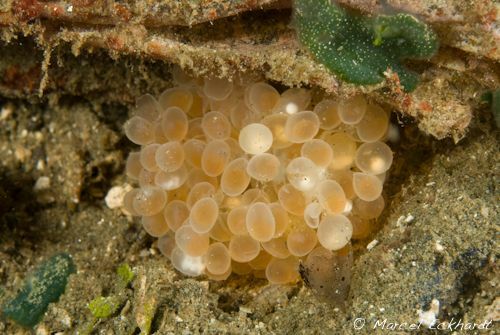 Maluku frogfish eggs. Photo by Marcel Eckhardt. Limited sightings: Lack of mates for successful breeding keeps them deep. Eggs attached: Female holds onto eggs until she finds a mate. 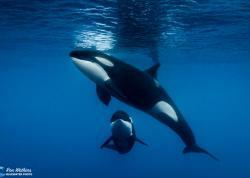 Heads to shallow grounds after finding her mate and successful fertilization is completed. Warmer waters, no immediate predators. 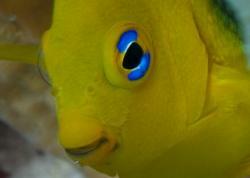 Blinking lights at the corners of its mouth (reported by Marcel Hagendijk) explains the lack of the lure. Frogfish can live a very long life when undisturbed, and I hope that I have the opportunity to learn more the next time I'm down there. 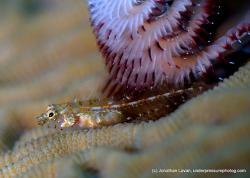 Maluku has mapped has several dive sites that are reliable for spotting specific critters like Mimic point. A site named after the resident Mimic Octopus and Wunderpus found living there. The site is a gentle sloping point, swept by current. The tidal changes bring a menu of goodies for the animated little cephalopods to feed, survive and breed. 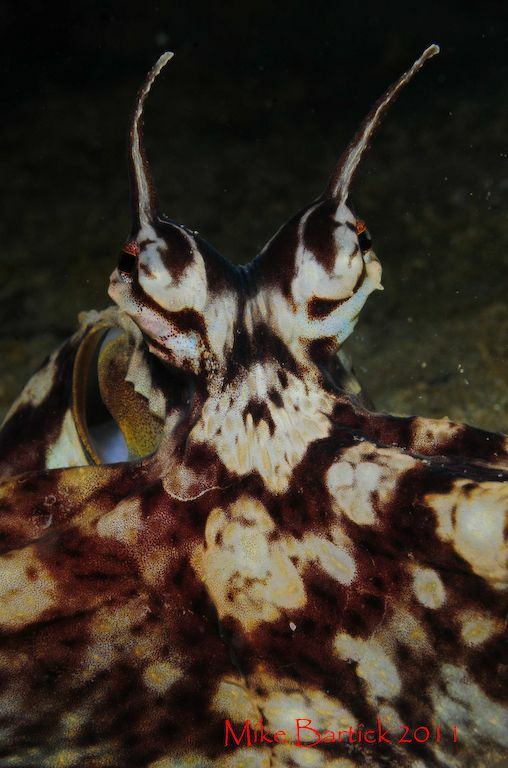 Mimic Octopus has longer frondosa over the eyes as compared to the Wunderpus. 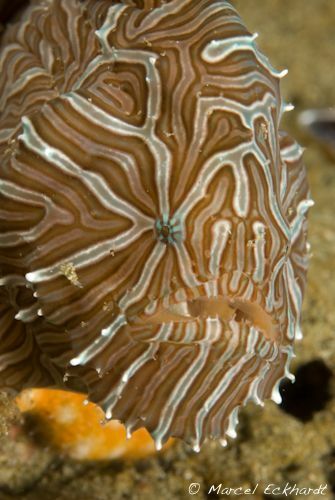 The Mimic is mottled in coloration and tends to be darker brown to purple and black. The tentacles are banded with thick white lines and the underside also has a white longitudinal line. The Wunderpus has white bands but tends to be a bit more brown- green when flushed. Minutes into the dive we find our first Mimic. First and foremost, these guys are octopus, duh! So, in my book, this means they are playful when engaged, so how do we engage them? Finding them first can be a bit tricky so what I look for is a twig like object that sticks out of the sand. I scan the terrain looking ahead and from side to side while moving slowly forward. Once spotted, I use my little chopstick to coax them out of their lair. Tapping on the sand near their hole they will peer out with curiosity, using their large inquisitive eyes and gaging for any apparent danger and proceed with caution. At that point i offer them something like a shell, or a stick, in some cases my trusty chopstick. Slowly one arm reaches out, then another, and finally with confidence the octopus emerges. After I offered this timid Mimic my chopstick, and he decided to take it and make it his own. He leapt forward out of its hole and pounced on the stick, enveloping it with his shroud. He then picked it up under his tentacles and began dancing back and forth from tip to tip. I fired away attempting to shoot some funny photos before he got tired of the paparazzi. Finally he threw the stick back at me and trundled away in a frustrated manner. Funny, he only seemed to mimic a frustrated octopus for me. Both Mimic and Wunderpus seem to shape shift and imitate other creatures, I don’t doubt it that since they are cephalopods and are therefore some of the most intelligent animals in our oceans. But personally I think that the Mimic gets too much credit in that department as the Wunderpus does a pretty fine job at it too. A Wunderpus glides down slope on the hunt, perhaps mimicking a flatfish. 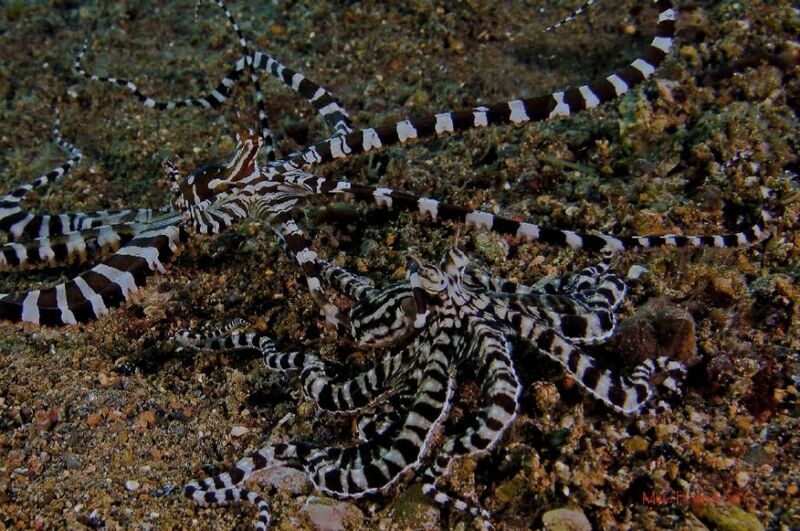 Clashing with a Mimic octopus and battling for hunting ground. Mimic and Wunderpus share the same habitat and often come into contact with one another. This particular Wunderpus is on the hunt, gliding over the sand resembling a flatfish, ever so cool. Suddenly a Mimic leaped from its hole and attacked the Wunderpus. Shutters snapped and strobes flashed as these two collided, wrapping themselves up then flying apart, repeating over and over again. I think the Wunderpus may have won this battle as it was extremely hostile and aggressive, repeatedly attacking the Mimic even when the mimic tried to retreat. I finally separated the two with my Good Samaritan act for the day. 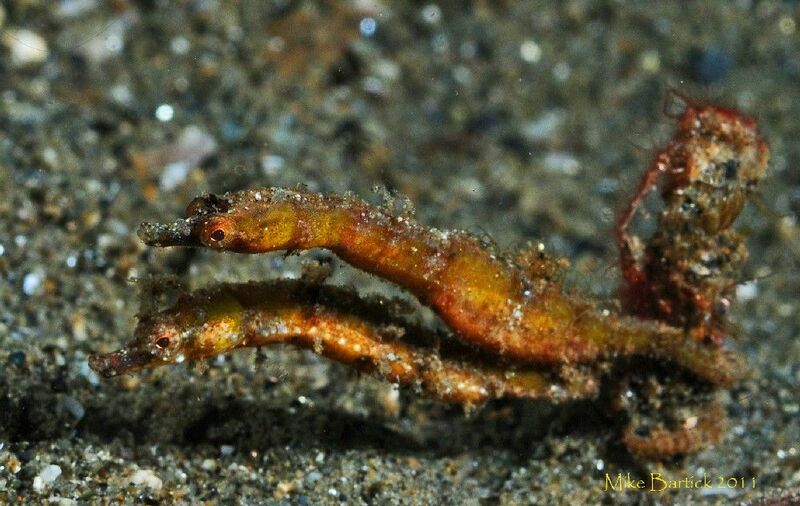 One of the primary critters on my list for this trip was the Pipehorse ( in the family of Syngnathidae which includes Pipefish, Seahorse, Weedy and Leafy Sea dragons and the newly described Lembeh Pipedragon). So far there are only a two scientifically described Pipehorse so i am always on the lookout for them. In typical Ambon fashion our ride to the dive site lasted about two minutes, we rolled in and slowly finned down slope. In cases like this its all about finding the food source, so we began to examine plant flotsam patches of algae and other interesting little places that the Pipehorse may call home. The guide flags me over and with high hopes I see what appears to be a small piece of dental floss in the sand. Looking through my macro lens I see two tiny little eyes staring back up at me. A few moments later I see another and suddenly it appears that we hit pay dirt. 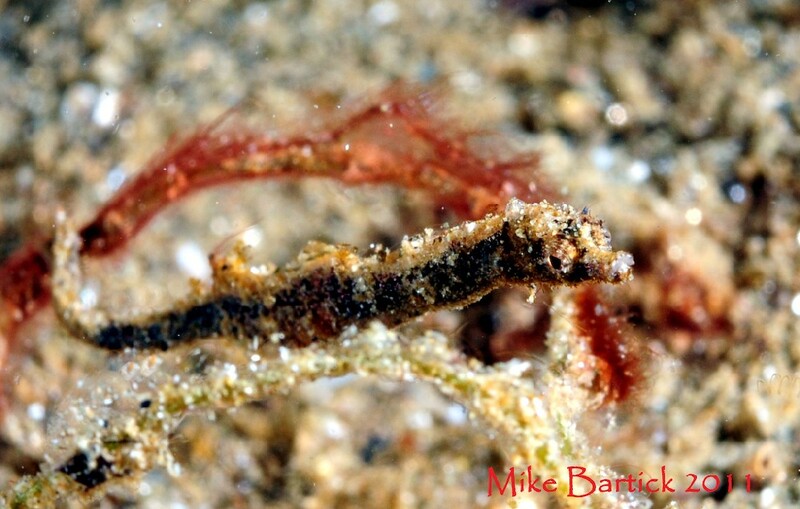 The cryptic Black pipehorse with sandy algae like appearance was very hard to detect. My guide deserves all the credit for finding this guy and after shooting a few frames we continue to look for others. Almost a half hour passed when we finally came upon these two adults getting frisky. Seahorses normally mate belly to belly so I assume these two pipehorses are just basking in the glow of each other’s company. The male is perched above the female, with tails wrapped around the little twig for security. Moving back and forth never allowing me to get them both in the frame together, I had to remove my +10 diopter and resort more drastic measures. Nearing the end of the line with my air, I slipped away and patiently waited, finally for a brief milli-second the eyes matched up in my plane of field. When I finally saw the skull and crossbones in my dive computer I decided it was time to get shallow, hoping that at least one shot was acceptable. 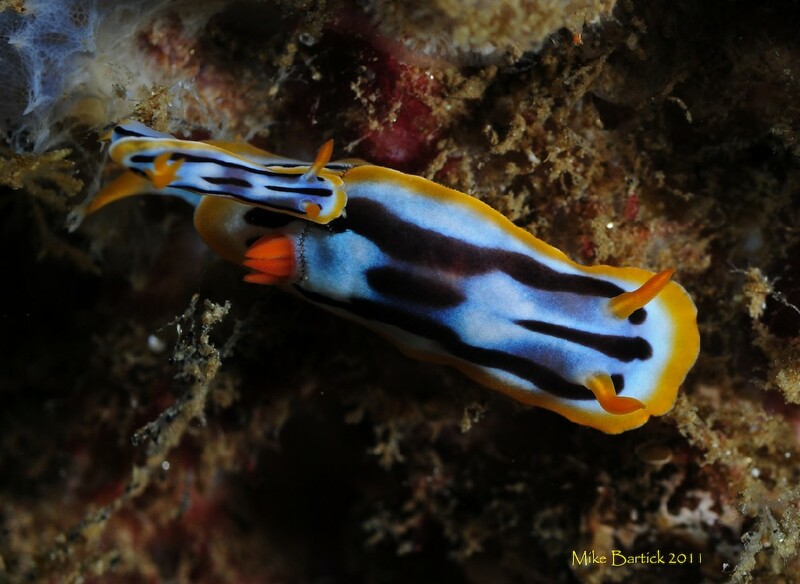 The nudibranchs in Ambon are again nothing short of incredible. Traditional to this region of the world a nice variety of nudis were found each dive. High f-stops and off camera lighting helped me with this common Flabellina and capturing animal behavior is always an intriguing shot. 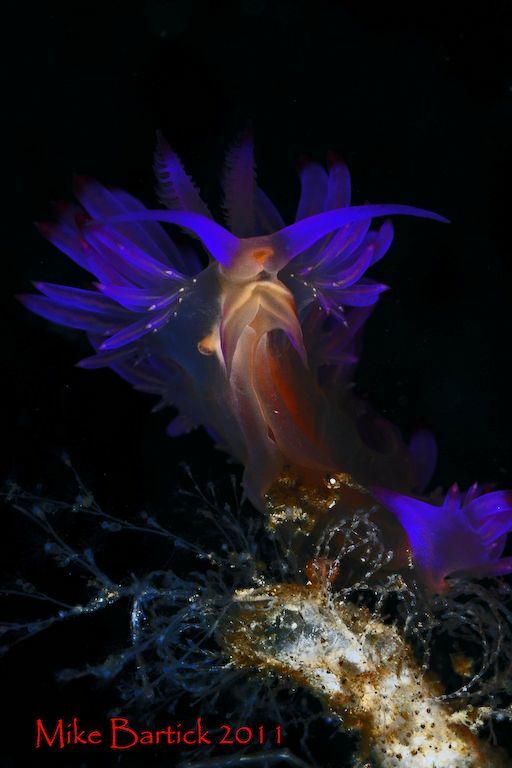 A high f-stop and off camera lighting helped me with this common Flabellina. Chromodoris with a tiny tag-along. So be sure to keep your head in the game, change your lens once in a while and add a little flavor to your trip portfolio. 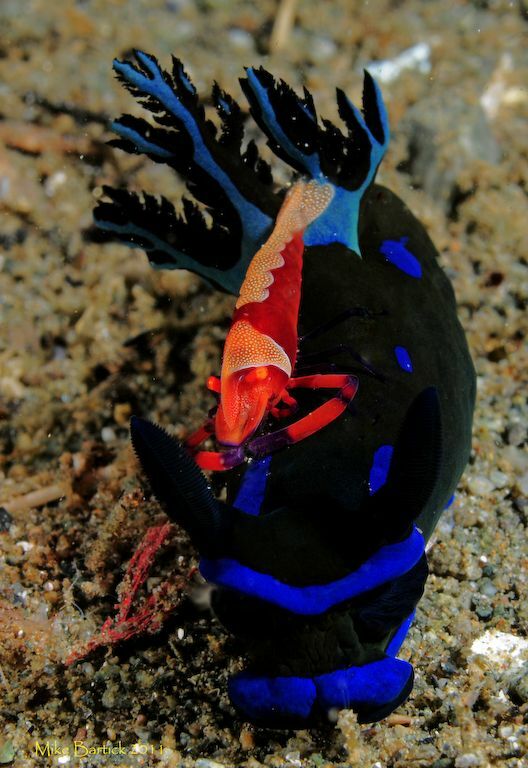 Ambon is a definite repeat retreat for me and the muck diving there is prime. Special thanks to Maluku Divers in Ambon, Andy Shorts, Marcel Hagendijk, Gladys Guy, and the guides that helped make this story happen. See you soon!